Background: Multidrug resistance (MDR) is a major challenge in the treatment of infectious diseases. The MDR in urinary tract infection causing bacteria, such as Escherichia coli, has made treatment of UTI very difficult. Objective: The aims of the current study were to synthesize a library of harmaline derivatives, and to evaluate their activity against various strains of multi-drug resistance (MDR) E. coli. Method: Harmaline derivatives were synthesized by the reaction of harmaline (1) with various acid halides and anhydrides. These compounds were subjected to susceptibility determination by in vitro MTT assay. 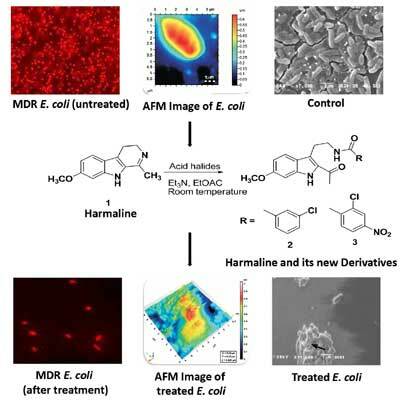 The changes in morphology of the bacterial cells after the treatment with harmaline (1) and its new derivatives 2 and 3 were studied through scanning electron, atomic force and fluorescence microscopy. Effect of harmaline and its derivatives on the production of Reactive Oxygen Species (ROS) in MDR E. coli was assessed through lucigenin chemiluminescence assays. Results: The selected compounds assisted the fluorescently labeled dye DiBAC4(3) to bind to the lipid rich intra-cellular entities, and thus produced a sharp green fluorescence by easily penetrating into the compound-induced depolarized membrane of MDR E. coli. These compounds have also triggered a significant generation of ROS from bacterial cells as compared to the conventional antibiotics. The current study demonstrated that harmaline (1), and its derivatives 2 and 3 were identified as anti-MDR agents against MDR strains of E. coli. Antibacterial effect of compounds 1-3 on MDR E. coli is possibly due to membrane depolarization due to ROS-induced damage to the bacterial cell membrane. Conclusion: Harmaline and its derivatives were identified as anti-MDR agents against various highly resistant and Pakistani MDR clinical isolates of E. coli. These compounds may serve as the leads for further studies towards the development of treatment against the infections caused by MDR E. coli. Bacterial cell, Escherichia coli, harmaline, membrane potential, multi-drug resistance, reactive oxygen species.